Hailed by bestselling writer William Kent Krueger as “the year’s best thriller debut,” this furiously paced ride into harm’s way features a drifter with lethal skills, whose mission to rescue his abducted sister pits him against a ruthless meth kingpin and his army of killers. Sixteen years. That’s how long Clyde Barr has been away from Colorado’s thick forests, alpine deserts, and craggy peaks, running from a past filled with haunting memories. But now he’s back, having roamed across three continents as a hunter, adventurer, soldier of fortune, and most recently, unjustly imprisoned convict. And once again, his past is reaching out to claim him. By the light of a flickering campfire, Clyde receives a frantic phone call from his sister Jen. No sooner has she pleaded with him to come rescue her than the line goes dead. Clyde doesn’t know how much time he has, or where Jen is located, or even who has her. All he knows is that nothing short of dying will stop him from saving her. Joining Clyde in his against-all-odds quest is a young woman named Allie whose motivations for running this gauntlet are fascinatingly complex. As the duo races against the clock, it is Allie who gets Clyde to see what he has become and what he can still be. 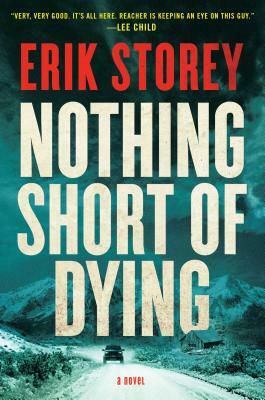 Vivid with the hues and scents of Colorado’s backcountry, and thought-provoking in its exploration of how past, present, and future collide to test resolve, Nothing Short of Dying is, above all, a propulsive, action-driven race against the clock. Erik Storey is a former ranch hand, wilderness guide, dogsled musher, and hunter. He spent his childhood summers growing up on his great-grandfather’s homestead or in a remote cabin in Colorado’s Flat Tops wilderness. He has earned a number of sharpshooter and marksman qualifications. He is the author of three Clyde Barr novels, Nothing Short of Dying, A Promise to Kill, and the forthcoming Leave No One Alive. He and his family live in Grand Junction, Colorado. "May be the year's best debut thriller. It leaps at you like a wolf." “Very, very good. It’s all here."